This most enigmatic and atmospheric monument has sparked much debate over the years. The use of the holed stone for divination and the curing of ailments has been often repeated, and was first mentioned by Thomas Tonkin of St Agnes about the year 1700, but the account by William Borlase1 is worthy of further repetition: "When I was last at this Monument, in the year 1749, a very intelligent farmer of the neighbourhood assured me that he had known many persons who had crept through this holed stone for pains in their back and limbs; and that fanciful parents, at certain times of the year, do customarily draw their young children through, in order to cure them of rickets. He showed me also two brass pins carefully laid across each other, on the top edge of the holed stone. This is the way of the Over-curious, even at this time; and by recurring to these pins, and observing their direction to be the same; or different from what they left them in, or by their being left or gone, they are informed of some material incident of Love or Fortune". The Daily Telegraph of the 8th of August 1963 states that a resident of St Ives said that in his young days he had seen a child being hurriedly dressed after such a ceremony2. Image courtesy of and © David Thomas. William Borlase produced the first known plan of the Mên-an-Tol and its accompanying uprights, published in 1754, which shows the stones in a triangular formation. His description of the site is also of a triangular formation. A further plan of 1778, drawn in the margin of an old estate map, was mentioned to Hencken3 by Charles Henderson, and this apparently shows the stones in the same arrangement, but may have been copied from Borlase's plan; this plan I shall be endeavouring to track down. By the time William Cotton made his plan of the monument in 18264 the three stones were in a line, as they are still. The possibility that the holed stone originally stood at a 90 degree angle to its present position has been postulated in recent times and Borlase's plan shows the stone approximately midway between the two positions. Such questions are unlikely to be ever resolved as the site has suffered much from excavation, treasure hunting and restoration over the years. In 1992 damage caused by the constant stream of visitors to the monument caused the Cornwall Archaeological Unit, now the Historic Environment Service, to stabilise the site. 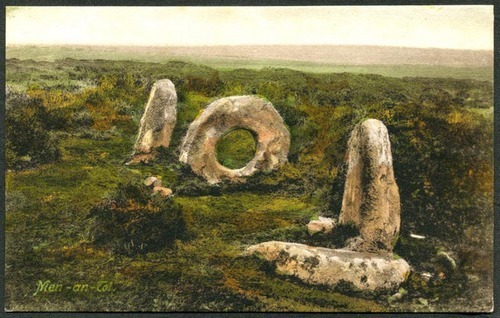 Part of this work involved cutting back the gorse in the immediate area of the stones, and it was discovered that the stones were actually part of a circle of stones, with 11 remaining, including the holed stone, and with a diameter of some 57 to 58 feet.5 In light of this discovery I would tend to describe the arrangement given in Borlase's plan as being closer to an arc than a triangle; though of course any three points on an arc will form a triangle. The possibility still remains that the holed stone was used as an entrance stone to the burial chamber of a barrow, and with the stone circle being the remnants of a retaining kerb. Though little evidence for this remains. There is a small and low cairn of stones, but this is localised to the area immediately south west of the holed stone. 2. Opie, Iona, and Tatem, Moira (eds). 1989. A Dictionary of Superstitions. Oxford University Press. 3. Hencken, H O'Neill. 1932. 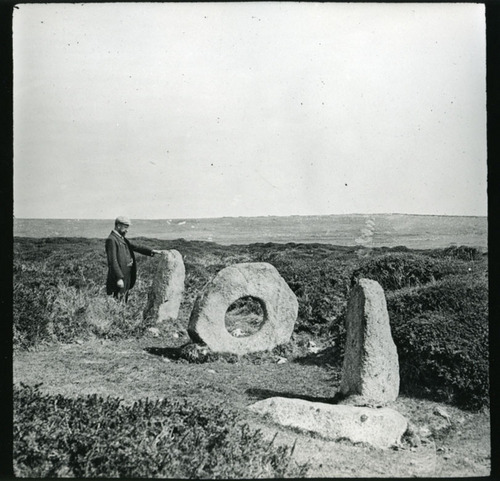 The Archaeology of Cornwall and Scilly. Methuen & Co Ltd.
4. Cotton, William. 1827. 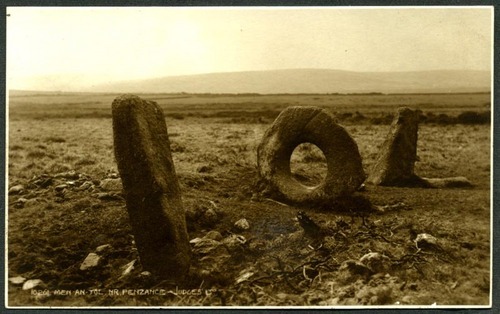 Illustrations of Stone Circles, Cromlehs and other remains of the aboriginal Britons in the West of Cornwall. J Moyes (2nd edition, Men-an-Tol Studio, 1998). 5. Preston-Jones, Ann. 1993. 'The Men an Tol reconsidered'. Cornish Archaeology 32, p5-16.